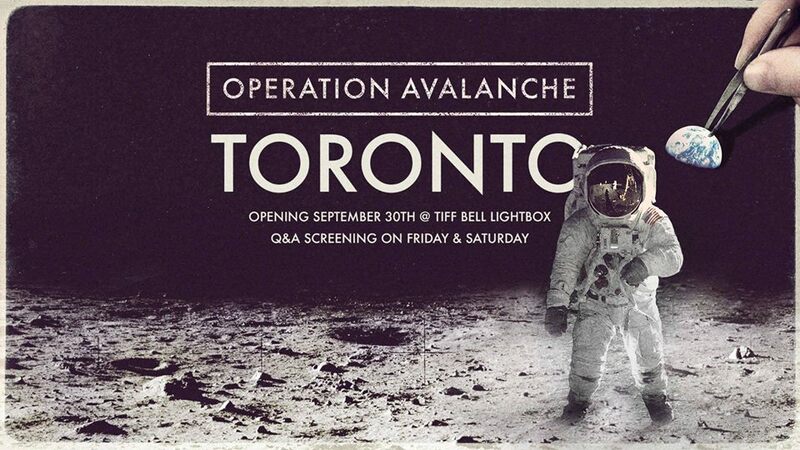 New Release : Operation Avalanche !!! It's finally here ! Did the the a/v department at the CIA in 1967 attempt to fake the moon landing ? Did Stanley Kubrick have anything to do with it ? What were the repercussions of this for everyone involved ? Matt Johnson and his team, building off of the conspiracy thrillers of Kubrick (Dr. Strangelove), the showmanship of Orson Welles (F for Fake) and the cynicism of Brian de Palma (Blow Out), takes on the history of cinema from its origins of Georges Méliès to highlight the veil of fiction and deceit of the cinematic medium. All you can really do is burn it all down to the ground. Other important references to keep in mind : With Operation Avalanche Johnson is building off the too-little-known space exploration films of Canadian cinema such as Roman Kroitor and Colin Low's Universe (while also poaching from another NFB documentary, Christopher’s Movie Matinee), which subject of space exploration the media theorist Marshall McLuhan would conceptualize in The Global Village in terms of an evolving human apperception. But perhaps, maybe a little indirectly, Operation Avalanche performs and demonstrates other concepts of cinematic deceit that have a long history. Lets not forget that Godard described televised space exploration footage as, “The picture is totally out of focus, you can’t really see anything. They’re always like that. There’s so much work and technique involved with making this type of image. It’s faked. Those are models, it’s pure George Lucas. It isn’t real.” Or that Orson Welles described the moon landing as a terrible event in the history of humanity. Leaving the space race aside, there's many important formal arguments at play in Operation Avalanche. As the name of Johnson's production company, Zapruder Films, implies: There was a moment when the world lost its innocence, all we can really do is re-watch the primal scene to attempt to figure out what really happened. And for more of my writing on Johnson and my original review of Operation Avalanche just click on the linked titles. Slowly rolling out to magazine and book stores in the upcoming week, the new Cinema Scope offers a great survey of the Fall new releases, festivals titles and other cool movie stuff. Pick it up if you can! Follow the linked titles to see some of my own previous pieces on these emerging Toronto filmmakers: Toronto DIY Filmmakers, New Canadian Film Movement, Interviews with the DIY Filmmakers, and Young Canadian Directors. With the premiere of nirvana the band the show at TIFF and then shortly after the theatrical release of Operation Avalanche it’s worth reiterating the obvious fact about Matt Johnson: an inventor of forms, changing the medium and probably one of the most exciting things to happen to Canadian cinema in a long time. With Operation Avalanche, about two agents from the CIA a/v department attempting to fake the moon landing, Johnson showed that all images are manipulations, fiction, and lies as they’ve been corrupted in the process of becoming a means to an end. So what to do next? A remake of his earlier web-series nirvana the band the show: two hapless losers trying desperately to get a music gig at the The Rivoli. After the departure from Eden due to the loss of grace of the image all that that all can be done is recount the defeat ad infinitum, and with their brief 25 minute running time (always rebooting from scratch), nirvana the band the show tells the story of this defeat. Nirvana the band the show, or how to capture the world? Some might talk about Johnson’s mise en scène as that of regular television à la Arrested Development but it’s actually a lot more sophisticated than that. Not only are there symbolic details that reappear throughout the season (explicitly addressed or just as background information) but the images themselves are conceptualized. Nirvana the band the show, which started as a web series, is the logical conclusion of new media as it brings together many of the aesthetics, formats and viewing patterns of the internet, video games, television and cinema and turns them into a new video form. Take the show’s living room, for example: A poster of the world, Jacques Cousteau exploring the oceans, NASA moon landing imagery and all sorts of Criterion Collection posters. Johnson overflows the image with too much information (in a style similar to too many tabs open in a browser) to suggest red herrings and to provide an interactive relationship with the viewer to then follow up on their meaning, in a way similar to David Foster Wallace and all of his footnotes. This aesthetic development parallels another major one for video games from the year 2016: that of John Hanke at Niantic launching Pokémon GO. Just like how Johnson gives the spectator the tools to play with all of the associations in nirvana the band the show, Hanke with his new augmented reality cellphone app he got people to go outside, altered their perceptions of their surroundings and brought a newfound sense of joy and of play into the world. This leap into the imaginary is also there in Nirvana the band the show. For Johnson the réel is imagination: How to take an overlooked recognizable Toronto site, distilling it of its blandness and making it pure fantasy. This use of imagination is perhaps Johnson’s greatest tool and its perhaps even more important as its lacking in abundance in Canadian cinema. As why are there so many Canadian films that are slaves to the mundaneness of reality and who by focusing on ‘social oppressions’ just recreates without ever offering any room to escape? So when Johnson and Jay McCarroll make a joke or speak nonsense it is an attempt to eclipse current social relations or an understanding of language to begin again from scratch, to find the zero degrees from which a new world can spring from. This is why their important. As per nirvana the band the show being like the internet, it is in fact a repertoire of popular culture: from its opening credits that riff on popular TV shows, to the many subject of conversations and memorabilia, to the activities of the characters and the styles in which it is shot. There’s a fan fiction quality to the show (with Spielberg as the Lord presiding over it) and it takes a negotiated response to popular culture where smart ideas can be extrapolated from bad object movies (Johnson’s discussion of Ernest Goes to Jail is quite funny). But this idea of the musical riff, that of tonal variations offering new possibilities of experience, is perhaps best illustrated by Jay McCarrol’s piano routines. A professional musician with close connections to the Yuk Yuk’s comedians, McCarrol brings a warmth, liveliness and sense of morals to Johnson's conniving. I could go on about how Johnson got to where he's at on his own terms (with a blunt approach to denouncing many of the mediocrities of the Canadian film industry), or how he’s like the Canadian Godard (experimenting in all sorts of formats, poaching from all sorts of media to tell the important tales of the 20th and 21st Century), or further discuss the importance of Spielberg and Abrams on him (Star Wars: The Force Awakens plays a big role in one of the episodes), or the importance of video games and the film Hackers to his work (the idea with playing with temporal association, how to take command of the networks for one’s end) and so on. But let me just conclude by reiterating my first point: After taking on all of film history (Operation Avalanche), now returning back to the city and to just burn it all to the ground (nirvana the band the show), his next projects include a John A MacDonald film where he’ll take on the entirety of Canada and its history and then he's planning a remake of Command and Conquer: Red Alert where he’ll take on one of the biggest crimes against humanity of all of History: The Holocaust. The time has come where the networks are failing and the viruses are taking over. The era of Matt Johnson. A work-in-progress chart to show a version of the evolution of Canadian film (click here to see it in full-scale). Many of these filmmakers have work at TIFF which includes Arrival, We Can't Make the Same Mistake Twice, Anatomy of Violence, Maliglutit, Two Lovers and a Bear, Weirdos, Juste la fin du monde, The Bleeder, Hello Destroyer, Old Stone, Werewolf, nirvana the band the show, Pays, India in a Day, The Stairs, Blind Vaysha, A Funeral For Lightning, Tout simplement, A Cool Sound from Hell and Nelly. Check out some of them if you can!